Gold & Silver-Bearish reversal patterns this month! Gold & Silver long-term trends have been lower since highs back in 2011. Counter trend rallies have continued to frustrate metals bulls as they continue to fizzle out. Are current counter trend rallies in Gold & Silver about to fizzle out again? 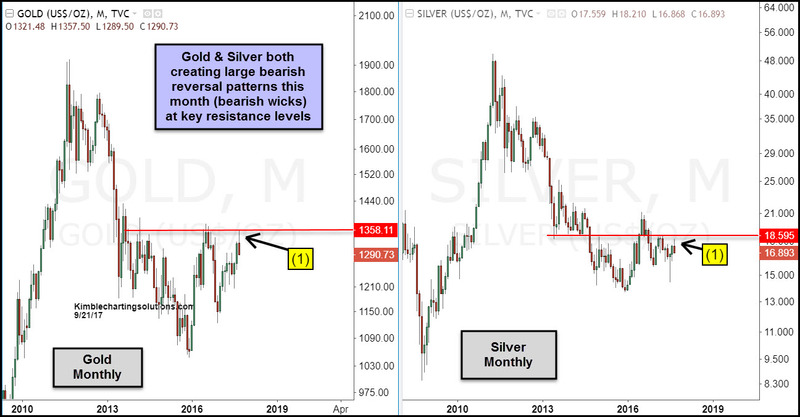 Gold and Silver this month tested resistance lines that were based on old highs/lows at (1). 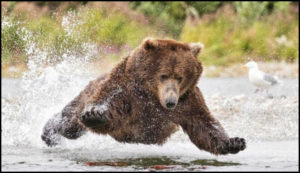 As both were testing the underside of this resistance, both have created large bearish reversal patterns (bearish wicks) at each (1). Metals bulls do not want to see this type of pattern at resistance, while in long-term downtrends. This could also be concerning news for metals bulls, as traders have established positions where historically Gold and Silver were closer to highs than lows. The Power of the Pattern has been sharing this chart for the past few months with Premium and Metals members, preparing them for this key level. If patterns in the metals complex is of interest to you, we would be honored if you were a member.